My chives are loving the weather lately. They are both lanky and bushy. When they’re flourishing, I top everything short of dessert with minced chives. I’m thinking pesto would be a bright note with the simple pan-seared chicken breasts I was planning for dinner. 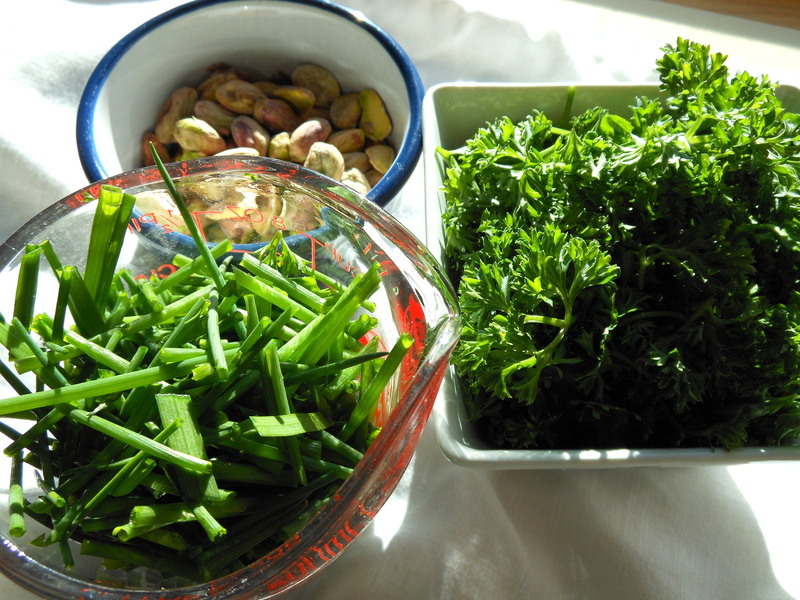 I had a bouquet of parsley* sitting on the counter, next to a bowl of pistachios. Methinks ’tis time for chive pesto. 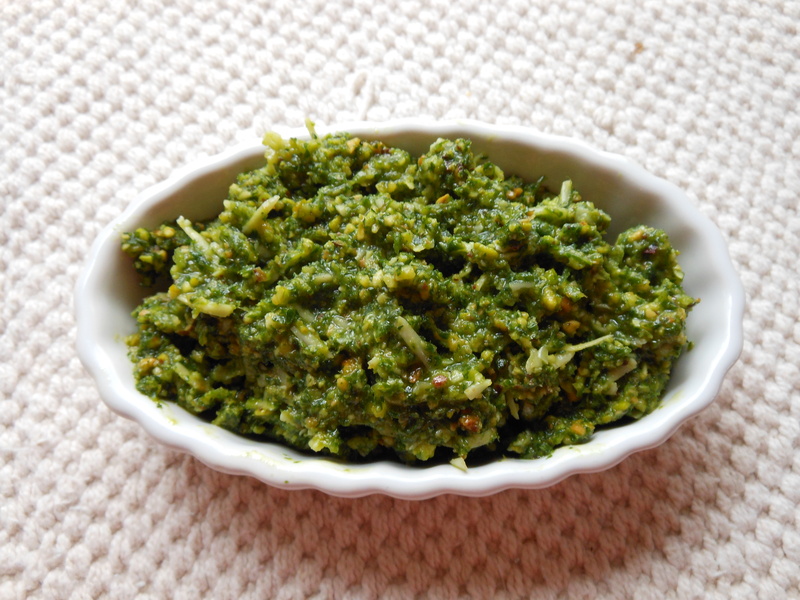 This pesto is intensely green, with a grassy note from the parsley and mild onion flavor from the chives and scallions. A squeeze of lemon is just enough to bring the herbs into focus. My Tom hates basil with a devout passion, so it took some work to convince him to try this pesto. He was a convert. I knew he would be; he loves all things onion. Now, Luke loves basil pesto, but has disliked onions his whole life. He too approved of this version. What we made next with it: potato-prosciutto pizza. Beyond fantastic. I’m already thinking of all sorts of uses: A spoonful coating some steamed baby red potatoes, a dollop mixed with sour cream or Greek yogurt for a dip, a dab swirled into a bowl of roasted potato soup. Put the pistachios and garlic in the bowl of a food processor and pulse until finely chopped. Add the chives, scallions, and parsley. Drizzle with half the oil. Pulse several times until finely chopped. Add more oil and pulse until the pesto is smooth and a consistency that makes you happy. Season with salt. Stir in the parmesan. It’ll keep for several days tightly covered in the fridge, or for months in the freezer. This entry was posted in appetizers and tagged chives, herbs, parsley, pesto, sauces, scallions, vegetarian. Bookmark the permalink. Hi Nancy: I’ve got dough rising for pizza tonight, and you’ve just reminded me of that leftover cress-ramp pesto (cresto!) in the fridge. Thank you very much. I think a potato-cresto pizza will do very nicely. Any luck locating ramps in your area yet? I dug my first of the season, quite small still, on Saturday. Mmm, cress-ramp pesto sounds fantastic. I checked again a few days ago; still no ramps. I need to expand my search territory, I think. And no surgery, thank goodness–just the brace for a total of 5 to 8 weeks.